The Criminal Investigations Division (CID) has sought the assistance of Interpol to locate former Central Bank Governor Arjun Mahendran. Police Spokesman SP Ruwan Gunasekara told the Daily FT yesterday that Mahendran, who had been summoned to appear before the CID yesterday, had failed to make the appointment. “He did not show up to appear before the CID. 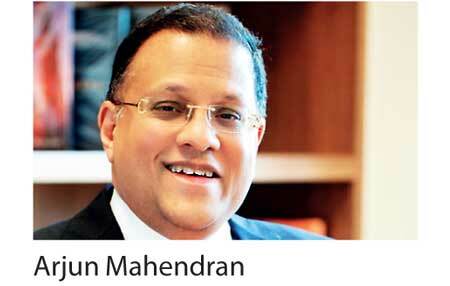 So now the CID, through Interpol, has requested Singapore for the location of Mahendran,” SP Gunasekara said. He went on to say that once Interpol has responded to the CID’s request they would decide on further action. “Once we have received a response, we will discuss our next move with the Attorney General,” the Police Spokesman said. The former Central Bank Governor is directly involved in the 2015 Central Bank Bond scam. The Presidential Commission of Inquiry investigating the Bond Scam, appointed by President Maithripala Sirisena, found Mahendran to have colluded with his son in-law Arjun Aloysius, who is the owner of Perpetual Treasuries Ltd. The PCOI report states that Mahendran was involved in insider trading with Aloysius to give an undue advantage to Perpetual Treasuries during the 2015 Central Bank bond sales, causing an estimated Rs. 11 billion loss to the State. Aloysius and Perpetual Treasuries CEO Kasun Palisena have currently been remanded and both are expected to be produced before the Colombo Magistrate Courts today.